Schultz Fellows learned about SpaceIL and Beresheet’s imminent landing on the moon. They are, from left, Eli Davidsohn, Erin Laizerovich, Marco Rodriguez, Andi Bonner, Jhil Wilkins, Heather Rindfuss; front row, Anna Tasciotti and Adriana Meyerovitz. The Schultz Fellows program partnered with the iCenter and SpaceIL, an Israeli organization that will land a spacecraft on the moon. The craft, named Beresheet, is scheduled for a landing today (April 11), and will measure the moon’s magnetic field, using technology developed specifically for the mission. Beresheet, Hebrew for “in the beginning,” and the first word of the Torah, launched from Cape Canaveral in February 2019. The Schultz Fellows, spearheaded by the Schultz Family Foundation, is a program of the Center for Jewish Education of the Jewish Federation of Greater Dallas and the iCenter. SpaceIL’s collective vision is to create a new “Apollo Effect” — or rather, the “Beresheet Effect” — to inspire the next generation in Israel and around the world to think differently about science, engineering, technology and math. Through this mission and innovative educational materials, the next generation will deepen their relationship with Israel, and further spark their curiosity to dream and achieve. Nir Amitai, who is part of the SpaceIL team, is at Mission Control to oversee Beresheet’s landing. On April 3, Amitai visited Dallas, where he spoke with hundreds of students and educators in person, at Akiba Academy, and with hundreds of other students and educators in New Orleans, Chicago, West Hartford, Connecticut and Tokyo, Japan, via Zoom. 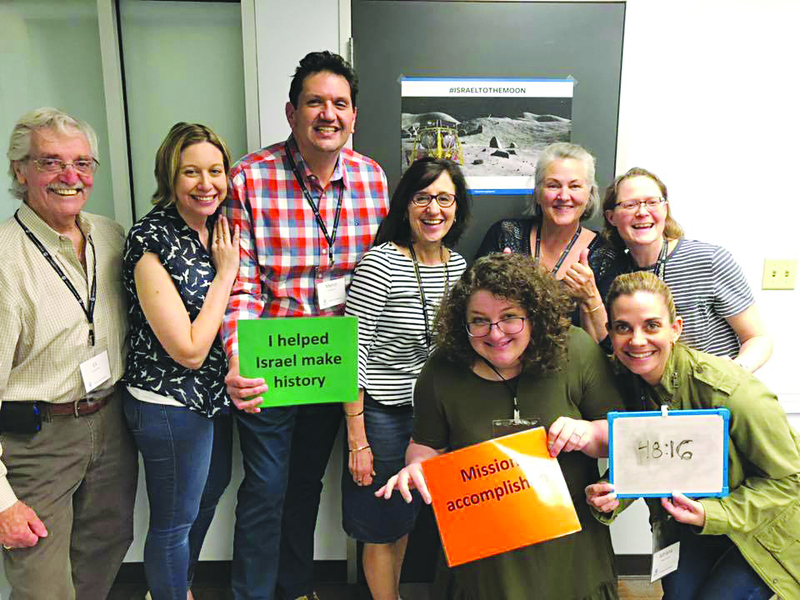 In addition, the iCenter’s Dan Tartar spent two days in Dallas, facilitating Israeli educational activities with the Schultz Fellows, as well as students at Levine and Akiba academies. The Schultz Fellows and community professionals experienced an Israel Education escape room. All of the activities focused on SpaceIL’s moon landing. To learn more about the Schultz Fellows and Israel education, email Peta Silansky at psilansky@jewishdallas.org.